As a training facility, we offer professional flight training in accordance with Part 61 of the Federal Aviation Regulations. All of our flight instructors are independent high time professionals working with programs providing the best quality training. They schedule for the convenience of the student who they teach on a one-on-one basis, and are available 7 days a week. We are now enjoying a loyal customer base of about 400 members and an excellent reputation around the San Francisco Bay with the aviation authorities and other aviation businesses. Its record of safety shows for the quality of flight instruction provided as well as the maintenance which is a priority in order to meet our safety standards and the enjoyment of our customers. Each student is different and learns at a different pace. The duration of your training will vary with your goals and time available. 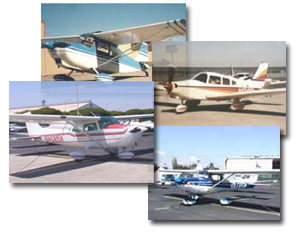 3 to 6 months is an average time investment for earning a private pilot certificate. This time may be as short as 1 or 2 months for a committed full-time student. "Guaranteed packages" don't leave room for individuals and are therefore not offered at Oakland Flyers. We have compiled estimates of training costs that will give you a realistic idea of the financial commitment necessary for you to reach your goals. These figures will vary from student to student. For more information, refer to our Training page. "Pay as you fly". Oakland Flyers allows each student to determine his or her own methods of payment. This financial flexibility allows students to start immediately and tailor their flying to their finances. Club members can realize a 10% saving when depositing US $500 or more in advance. For further member convenience, we accept both Visa and Mastercard. Oakland Flyers is located at the Oakland International Airport, on the beautiful San Francisco Bay. The Oakland airport is an FAA tower controlled airfield that boasts all the services of a metropolitan air terminal. In addition to 24 hour fuel and services, an FAA Flight Standards District Office, a Flight Service Station (aviation weather provider) and Terminal Radar Approach Control facility are all located on the field. Being located in some of the busiest airspace in the U.S., it qualifies our students to fly comfortably anywhere once certificated. The San Francisco bay area and Northern California are beautiful and provide an interesting and varied environment for flight training. Minutes to the West is the stunning Pacific coastline, a little over an hour to the East are the spectacular snow capped Sierra Nevada mountains.